In a recent interview with BlackWeb2.0 Tiffani Bell a recent college graduate and a Ruby on Rails developer and consultant mentioned a hands on Ruby Tutorial Try Rudy! Although my programming experience is very, very limited, I decided to try it. The tutorial took all of 15 minutes – which was just enough to stir my interest and possibly try my hand at it, I’ll keep you posted on that…. According to Wikipedia Ruby is a dynamic, reflective, general purpose object-oriented programming language that combines syntax inspired by Perl with Smalltalk-like features. Ruby originated in Japan during the mid-1990s and was initially developed and designed by Yukihiro “Matz” Matsumoto. 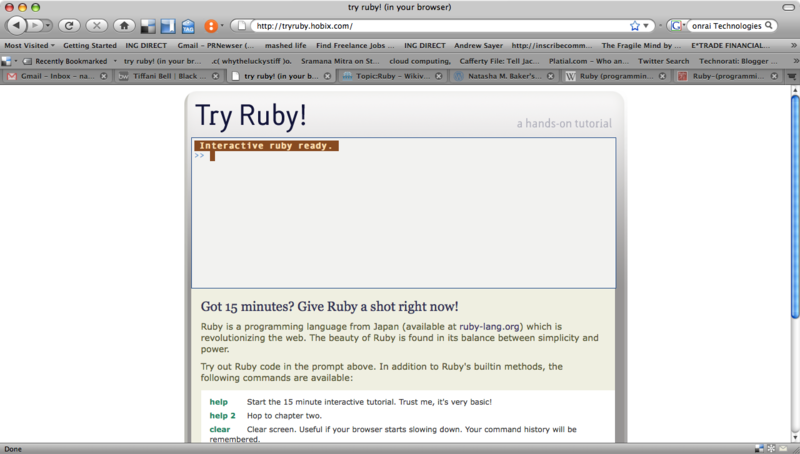 Got 15 Minutes?Give Ruby a Shot Right Now! The tutorial is provided by Why the Lucky Stiff a self-proclaimed “fledgling freelance professor, one who will die young and make no lasting impression.” If you would like to try the Ruby tutorial I have provided the link. Why the Lucky Stiff has also written a e-book, Why’s (poignant) Guide to Ruby. I’m still reading it, but so far it’s been a fun and entertaining way to learn Ruby.